I'm looking for bright ideas for a fix. I'm not looking for heirloom restoration, I only have one of the fabrics still in my stash. I used warm and natural batting so the quilt is stable. 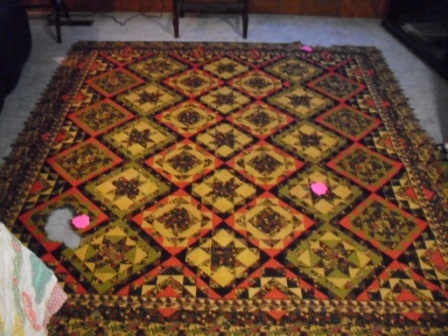 It is a double sided quilt, the other side is pink and teal and sage. I know many heads have to be better than mine alone, thanks so much! All I can say is WOW - that was one hungry dog. How about photocopying the material and make another block. Or photocopy same block elsewhere and replace as whole. Just an idea. I wouldn't know where to start. It's so beautiful and intricate. If the blocks weren't set on point, I'd suggest cutting it down for a lap and cover the smaller missing chunks with applique. Did all the cotton manage to pass through the dog's intestines? I'm sorry, this must be heart breaking for you. That quilt is so beautiful, that I would be sick. Maybe people on this board have bits and pieces of the fabric you need. I think I have a FQ of the gold. If not exact, it is close. I would send it to you if you like. I would be tempted to applique a dog shape on the large hole! Oh no, how absolutely heartbreaking for both you and your sister (assuming of course your sister was quiltworthy and really cared about it in the first place). If this quilt were mine I would be furious with my dog if it had ruined such a beautiful quilt as this and she would immediatly be relegated back to crate training when I was not around to keep an eye on her and at night. And belive me I love my dog dearly but destroying such a beautiful quilt would definitely lose her all her free house roaming priviledges. Is an entire corner missing? I can't think of any fix other than to cut off the bottom row and a half of blocks and bottom border where the entire corner looks to be missing. 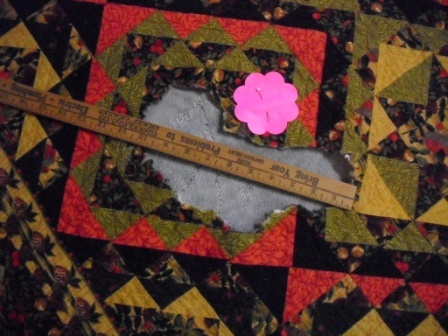 You could then unpick the quilting and use the fabric from the cut off borders that is still intact to remake the border and repair the bit at the top. You then would have portions of undamaged blocks that you could applique right over the damaged ones. If you want to maintain the size, I am afraid any fix you do will look like repair patches, especially the entire missing corner, even if you could somewhat match the fabrics. You could probably find a nice compliment to applique something over the center areas but that missing corner where you had mitered the border print... There is not much you can do. Wow. My thinking - turn the quilt into a square quilt. Remove that lower part with the missing corner and huge hole, and use the extra fabrics from that section to repair/patch the other holes. When she told me about it I thought easy peasy, cut it down and make a couch throw, but because the damage is on both sides it would be far too narrow to be of use. No, I wasn't heartbroken. And she was worth it. A dog shaped applique makes me laugh, thanks! thanks to all for your thoughts! feline, only where the pink stickynotes is where the damage is. The edge I would trim and bind as is, oddly shaped. The large one, a dog shape appliqué as a silhouette. Photo copy on a good copier isn't a bad idea. A label appliqué telling the story in a color that blended. The things we endure for our pets. Now I understand better why my mil asked that my kids sun bonnet sue quilts not be used, because of my cats. They are hand quilted. I wish she had made wall hanging size. If you go for the dog shape applique how about in a blending color and a la quilt labels the info on how the hole/applique got there. The smaller holes might be covered with a blending dog bone shaped bone. Hey...that was my idea too! Great minds thinking again!! Did you put a label on it at all? You could add one there! I LOVE the idea of a dog shaped applique. I'd find fabric that matched the coloring of the dog to use. Dog bones over the smaller spots would be great. And, even if there was a label on the quilt originally, I'd put another one on explaining the dog appliques. I know it's disappoionting/discouraging to have something you've labored over be damaged. 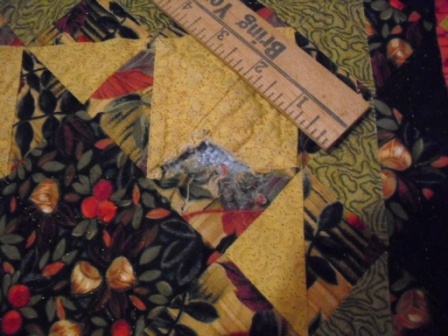 at this point, I'd celebrate it and make the repairs a prominent part of the quilt. I have a feeling this quilt will become more cherished once the repairs are made. It will be a contemporary quilt with a real story - wonderful! I like the ideas everyone came up with for applique and a new label. Great minds think alike!!! I was gonna say a doggie applique with dog bones, a dog house or even a fire hydrant to repair the holes. Sorry, I giggled when I read what happened. Since quite a large piece is missing, how about doing a black brick pattern in those areas. Make it kind of look like the quilt is emerging from the wall? The big dog appliqué would be fun fix also. 1) Does she still have that dog that chewed up the quilt? 2) You could go on www.missingfabrics.com or the classifieds here to see if anyone might still have some of those fabrics in their stashed. 3) Oy. My. Goodness. Bad doggie. Hey, that looks like what my dog does to our regular blankets!!! I keep my quilts away from him. He's a bad boy. I found a cute dog bones print with a brown background so got an 1/8 yard. I love that idea. I'll use to for the binding area and the smallest hole. I quit buying fabric in 2001. today doesn't count~! It was my first double sided quilt, all have been dual sided since then. and my baby sister, who owned it passed away this summer so it is a special repair job. My condolences on the loss of your sister. Not having the same fabrics to repair, I think applique would be the way to fix it...whether you do a dog or some stylish floral design. The back of the quilt you could just patch however you would need to fix it. Be creative...it may make the quilt even more beautiful! What a beautiful quilt. I can't offer any repair suggestions but like the dog applique and explanation. I ran into the same thing a couple of months ago. I didn't have any of the stash left from 10 years ago, so I matched the colors as close as I could. I first trimmed the area, then put the new small piece onto the hole (after placing a small piece of batting into the hole, and hand stitched the spot. She couldn't tell where - but I could! Her animal ate all the way through, so I had to replace the entire back. I then quilted it on the machine. It took me a couple of weeks, all holes are now filled and she's one warm happy camper once again! Love the dog appliqué idea! Use your printer: I would xerox the fabric you need to replace onto printer-ready fabric and go from there. Just saw the dog applique idea - a wonderful solution and less trouble. 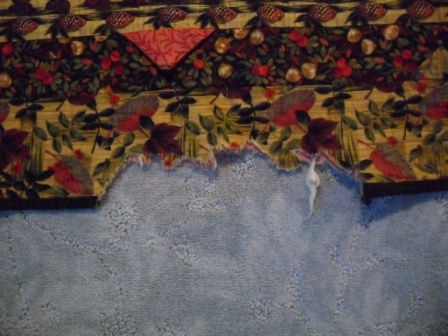 I am amazed at the amount of damage the dog did to that quilt. Quite heartbreaking, as it is very lovely. I have no idea for a fix, but all these ladies here will come up with the perfect solution I am sure.